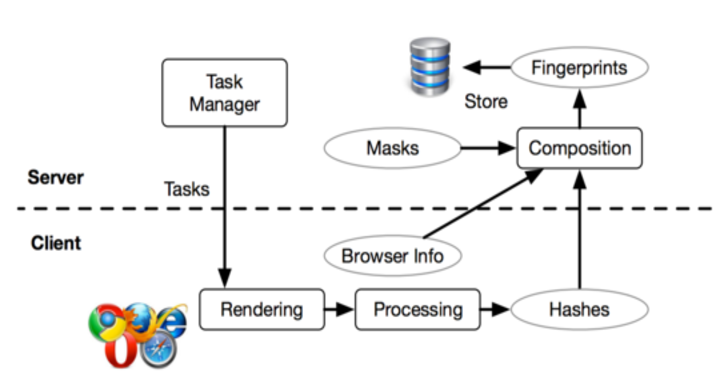 New Cross-Browsing Fingerprinting technique can now track online activity across multiple browsers. Coming soon to a browser near you. You might be aware of websites, banks, retailers, and advertisers tracking your online activities using different Web “fingerprinting” techniques even in incognito/private mode, but now sites can track you anywhere online — even if you switch browsers. A team of researchers has recently developed a cross-browser fingerprinting technique — the first reliable technique to accurately track users across multiple browsers based on information like extensions, plugins, time zone and whether or not an ad blocker is installed. Previous fingerprinting methods usually only work across a single browser, but the new method uses operating system and hardware level features and works across multiple browsers. This new fingerprinting technique ties digital fingerprint left behind by a Firefox browser to the fingerprint from a Chrome browser or Windows Edge running on the same device.This makes the method particularly useful to advertisers, enabling them to track online activity and continue serving targeted advertisements to online users, even if they avoid them by switching browsers. The new technique can be found in a research paper titled (Cross-)Browser Fingerprinting via OS and Hardware Level Features [PDF] by Lehigh University’s Yinzhi Cao and Song Li, and Washington University in St. Louis’ Erik Wijmans. The researchers also noted that this new cross-browser fingerprinting technique is not too bad, as in some cases, the method could be used as part of stronger multi-factor user authentications across multiple browsers. For example, Banks could use this technique to check if a user logging into an online account is using the computer that has been used on every previous visit, making sure the login was legitimate even if the user is using a different machine to usual. The researchers plan to present their paper at the Network and Distributed System Security Symposium scheduled for February 26 through March 1 in San Diego, California.